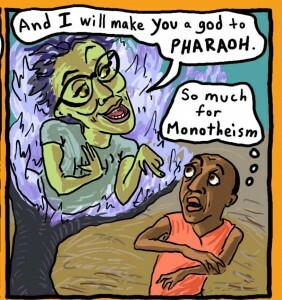 Moses is black and God is green — and a she — and both bear a strong resemblance to their real-life creators in “The Comic Torah,” a graphic reimagining of history’s enduring bestseller. Husband and wife Aaron Freeman and Sharon Rosenzweig have written and illustrated a biblical midrash that is colorful, deep, funny and mind-blowing — just like the original. And just like in the original, holy business is a messy business. And no one in the Torah is more contradictory and unfathomable than God herself, known here as YHWH. As the Five Books unroll — with each Torah portion presented in a sumptuous double spread — the relationship between God and Israel develops in all its glory and chaos. What caught my imagination was the shifting relationship between God and Moses, sometimes like parent and child, other times like mistress and servant, and still others as mismatched lovers, even as Moses dreams of the Promised Land. “The Comic Torah” doesn’t disparage the tradition that has grown up around the Torah. Freeman and Rosenzweig have clearly wrestled with the text. But they have also tapped into one of the secrets of the Torah’s resilience, it’s weirdness and primalness. “The Comic Torah” reads like a strand of tradition that never made it into the canon. Disclosures are in vogue. I’m never quite sure if the people who disclose really need to disclose, or if they get some sort of ego rush from doing it. While I’m sorting that out, I’ll tell you that I’m a big fan of Ben Yehuda Press, which published “The Comic Torah.” I wrote about another one of their books here. Also, I was a member of a group that helped fund the printing of “The Comic Torah.” So go now and read. Smoking Frog, Flat Nose and other names. Plato: Also known as "Stocky"
My parents named me in memory of my father’s younger brother. That’s what the name David meant to them. But David is also a Hebrew name meaning “beloved.” We don’t give a child a name for its literal sense nowadays. If a name has a meaning it’s a sentimental one, or because the name is novel or fashionable. In an article in the London Review of Books, James Davidson writes about names that not only “could be meaningful but … [also] were meant.” Davidson covers Anglo-Saxon naming practices and surveys the transformation of baby naming in the U.K. since 1800 before he gets around to his focus, which is ancient Greece. “Ancient Greece was a culture where names were assumed to mean something,” he writes. “Just as we translate Native American names such as Tashunka Witko (‘Crazy Horse’), Tatanka Iyotake (‘Sitting Bull’), Woqini (‘Hook Nose’) and Tashunka Kokipapi (‘Young Man Afraid of His Horses’), and even those of the ancient Maya (King ‘Jaguar Paw II’, ‘Smoking Frog’, now renamed ‘Fire Is Born’), so we could refer to famous Greeks as ‘He Who Loves Horses’ (Philip), ‘Masters (with) Horses’ (Hippocrates), ‘Flat-Nose’ (Simon), ‘Stocky’ (Plato), ‘Famed as Wise’ (Sophocles).” he writes. Ancient Israel also was a culture where names met something, at least it seems so. The Bible is full of people who were given names that reflected their essence or circumstances. Adam was named for the red earth from which he was created. Sarah laughed when told she would conceive in her old age and named her son Laughter (Yitzhak). Jacob was born grabbing the heel of his elder twin brother Esau and was named Heel (Ya’akov). Pharaoh’s daughter saved the infant Moses from drowning in the Nile and called him Drawn from the Water (Moshe). So we have Ishmael (“God Has Heard”), Dan (“Judgment”), Yosef (“Addition”) and Yisrael (“Wrestles with God”). And the retinue of angelic names — Michael, Raphael, Gavriel, Uriel, Ariel — with the name of God — El — as the second element. Or were those meanings read into those names? Did Moses’s name take on that meaning only because Moshe sounds like the Hebrew for “the one who is drawn out”? Similarly, I wonder if Jesse and Mrs. Jesse named their youngest son Beloved because they thought it fit him, or because they really liked the name David? David M. Bader writes quiet, spare, funny books. His newest, “The Book of Murray,” was published last week. Its subject is the until-now lost book of the prophet Murray — part Moses, part Elijah, part Shecky Green. A man who draws a blank when the people put too much pressure on him to prophesy. So he grabs the first topic that he can think of: doom. Bader is the dry wit behind “Haikus for Jews,” “Zen Judaism,” and a couple more. He brings his less-is-more style to the tale of Murray, a man who answers God’s call only to find that He never picks up the phone or even checks His messages. And it came to pass that one day, when tending a small bush, lo, a sheep appeared before him. And the sheep was ablaze and aflame and also on fire. And though thou wilt be enslaved, persecuted, and downtrodden for centuries, look on the bright side. For though the Lord will destroy you, later he will redeem and bless you. David Holzel: The book jacket says you began working on this book after an image of the Prophet Murray appeared to you on a toasted bagel. What happened after that? How did this book come together, and how long have you spent on it? David M. Bader: First, I ate the bagel. I have priorities. Then I spent a lot of time reading the Bible, especially the books of the prophets. And then I tried to figure out how a book of an ancient prophet could be more modern and entertaining. Something like the Book of Jeremiah – but funny. This book shows you as more than conversant with the Bible/Tanakh. Are you? sometimes it’s helpful to be a little clueless. These days it can be dangerous to treat religious persons and texts with anything less than gravitas. Do you fear a fatwa for publishing “Murray”? going to call “Haikus for Islamic Fundamentalists.” But I decided not to go forward with that when I realized it didn’t rhyme. With Jews continuing to assimilate and newer ethnic groups taking our place, I’m surprised that it’s still possible to make Jewish jokes. Are you finding it easier or harder than ever? Interesting question. For me, Jewish humor is a challenge right now because some of the older subjects are still good targets of satire for Jews of a certain age. But then there are younger Jews, some secular, some Modern Orthodox, who have a new, very different set of idiosyncrasies. We’re a diverse bunch. I’ve tried to strike a generational balance in “The Book of Murray.” Most Jews still share a sense of humor, so I’m hoping people will laugh even at jokes that don’t quite apply to their personal circumstances. Your earlier work, your haikus especially, was widely circulated electronically. I was amazed and somewhat appalled to receive them in emails year after year. No one appeared to recognize or wonder about the source. Did you receive those emails? existed for all practical purposes. I’m glad that people enjoy my writing, but it’s frustrating that they don’t take two seconds to find the source and mention it when they share passages over the Internet. One Google search usually leads right to the books. Am I ranting? Ok, I will stop now. You have enough books out to have an oeuvre. How would you sum up your published works, your style, your themes to date? I can make them, touching on Jewish themes. I have also written on topics that are not Jewish. “One Hundred Great Books in Haiku” has no Jewish references that I can think of. I didn’t set out to write exclusively on Jewish themes, but they do show up a lot, I suppose. The Jewish references tend to be more cultural than seriously religious — Jew-ish, perhaps. Possibly it’s a New York thing. In this book I hear echoes of the younger, funnier Woody Allen, and Allan Sherman. Who has influenced you? Woody Allen looms large, as do Mel Brooks and other Jewish greats, including Borscht Belt stand-up comics, the Marx Brothers and so on. But I like lots of non-Jewish humor and satire, everything from James Thurber and Stephen Leacock to British writers – Jerome K. Jerome, P.G. Wodehouse and that sort of thing. Plus, I’ve watched a lot of bad television. Will there be a “Murray” movie and, if so, who will star? stage, but I don’t have any plans yet. What’s next for David M. Bader, writer? Hmm… I’m thinking about lunch and maybe a nap. Longer term, I have a couple of book ideas that I’m working on and we’ll see if they end up being funny and publishable. And maybe I will find another ancient scroll somewhere.